Decisions after poor prenatal diagnosis are not easy. We know the nightmare you’re living right now, we’ve been there too. The decisions to be made after a poor prenatal diagnosis are some of the hardest decisions a parent ever has to face. Only you and your partner can decide what is right for your baby, yourselves and your family. If you’ve not yet made your final decision, it is best to avoid those whose opinions may be clouded by emotion, whether they’ve made a decision to terminate or continue a pregnancy following poor prenatal diagnosis. What is right for one person may not be right for another. A safer choice is to talk to genetic counselors, doctors, maternal-fetal medicine specialists, therapists or special education professionals. They can give you an objective view of what the future may hold. If religious issues are in the picture, talk to trusted clergy who will support you no matter what road you choose. You should also do your own thorough research at the library or on medical websites to find out all you can about your baby’s condition and prognosis. 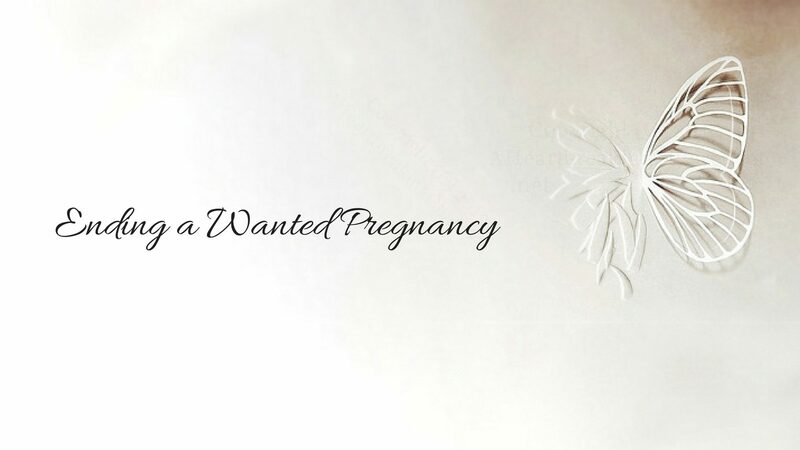 Here at Ending a Wanted Pregnancy, we have provided several pages with prenatal diagnoses information. Each page features a basic description of the diagnosis and a list of links to trusted medical websites that maintain the latest information on a given diagnosis. When reading the personal stories here, keep in mind that virtually all were written by laypeople, not medical professionals. Further, some of these stories are older, so the prognosis for a given diagnosis may have since changed. For the best information on a given diagnosis, rely on medical professionals and on the high-quality medical links in our Diagnosis Information pages rather than on individuals’ stories. Whether we decide to continue or end a pregnancy following a catastrophic prenatal diagnosis, our survival and healing require that the choice we made was the right one for us. Careful researching combined with honest soul searching is the only way to reach what will ultimately be the right decision for you. If you do decide to end the pregnancy, you can join our private support group to talk to other parents who have walked this path. You may also want to visit our Practical Information page which can help you locate a medical provider, learn about your options for procedures, determine your insurance coverage, understand local reproductive laws and restrictions, or find help with funding. If you decide to continue the pregnancy, we can help you locate support groups that deal with the specific issues you and your baby are facing. There are also many websites dedicated to supporting parents continuing a pregnancy following a poor prenatal diagnosis. Whether you decide to continue or end your pregnancy, you are not alone. Both paths have been traveled by many people, and those of us who’ve ended our pregnancies, as well as those who have continued, are reaching out to help you in this time of crisis. If you have questions about genetic counseling and genetic services, please contact your local genetic clinic, March of Dimes office or contact the National Society of Genetic Counselors. All-Options (f.k.a. Backline) is an all-options pregnancy resource that exists to help you explore every option in a safe environment with trained volunteers. Backline supports all pregnancy choices and is a respected resource for anyone faced with a momentous pregnancy decision. Their talkline is 1-888-493-0092. For those researching a condition on the internet, here is a link that offers tips on recognizing the trustworthiness of a medical website. If you’re concerned that your medical care provider has a political bias that may interfere with your care, learn how to find out if your doctor is anti-choice. We wish you peace, clarity, and comfort during your decision-making process.